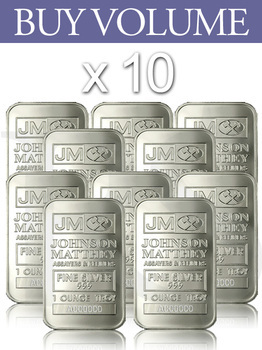 Volume Pack with minimum purchase of 10 or more pieces of Johnson Matthey (JM) 1 oz silver bar. With history of more than 195 years, Johnson Matthey silver bars or in short, JM Bars are one of the world’s most widely recognized and secure investment instruments. They are universally recognized hallmark assures almost instant liquidity throughout the world. These 1 oz silver bars are 99.9% pure silver, carry a unique serial number, and come with a very handsome JM engraving. 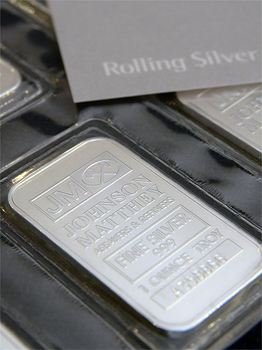 The front of each bar contains the inscription "JOHNSON MATTHEY, ASSSAYER AND REFINERS, FINE SILVER 999, 1 OUNCE TROY," and the unique serial number. Also available, Buy Volume for Johnson Matthey 100 oz Silver Cast Bar.